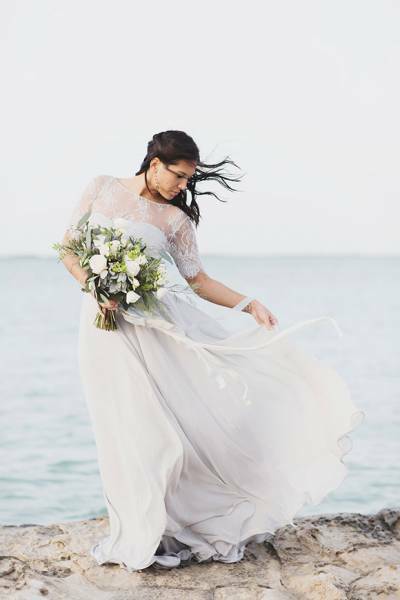 Eloping is such a romantic notion, especially when it's on wild and rugged coastline like this one from photographer MELISSA BEATTIE and stylist Jessica from LACE IN THE DESERT. 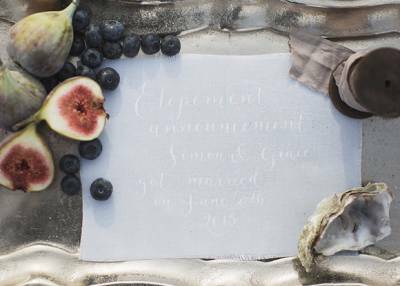 Jessica breaks down the shoot for us, �When Melissa invited me into her vision for a coastal elopement shoot, I was beyond excited. We wanted the aesthetic of this shoot to reflect our passion for fine art and film photography; beautiful, elegant and timeless. We found the perfect secluded spot on a rugged outcrop of Abu Dhabi's coastline in between the mangroves which cast the most exquisite array of blue and green tones throughout the water. We truly felt a million miles from anywhere. Our jaded grey dress and striking blue suit were both handmade especially for us by House of Moirai and complimented the ocean setting perfectly. Glen rocked the bespoke suit and Chorcha's lightweight skirt moved effortlessly in the breeze making our real life engaged couple look like true models. Light make up and soft hair from Jill accentuated Chorcha's stunning natural beauty. Handmade jewellery from Vitrine Designs finished our bridal look off wonderfully reflecting the organic tones of the sea. The intimate setting called for a sweetheart table which was created using grey and soft blue hues with brass and pearl finishes with the help of MyList. Our place settings were just one of the many intricate details that calligrapher Claire brought to life for us; the elegant handwritten 'bride' and 'groom' on the pearl shells were a personal favourite of mine. The florals were the perfect finishing touch. Darianna managed to convey the ethereal spirit that we wanted to capture with the beautiful movement of her arrangements and use of soft textures and colours. The cake with its handmade oyster shells together with the homemade macaroons provided a touch of elegant luxury to our setting.